This is one of the two photographs mentioned in the introduction to this section. 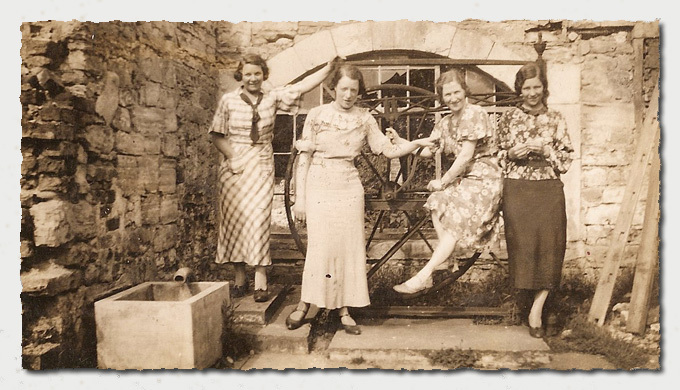 The image whilst extremely helpful in assessing the demise of the old hall, created a desire to know more about the picture and its companion shot of the ladies on the bridge. Note that this view is sepia coloured, because this is a scan from the original print, not a copy of a copy... thus providing a superior quality and allowing for greater interpretation, but more on this after the explanation. Until I had an opportunity to see the photos the link between the ladies by the pump and this set was unknown, now it all fell into place, the old copy I had received via the Garforth Historical Society, had been in the possession of one of the society members, he had died as mentioned earlier. But Susan knew that her mother had assisted both Graham Hudson, the author of the excellent book on the Aberford Railway and Garforth Collieries and the late Roger Davies from the Historical Society, with local history information. So she understood how a copy had come into my possession. 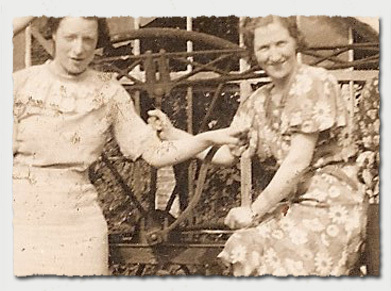 Now we know two of the people in the pump image, Beatrice Selby sitting on the framework and the lady standing to the left Eleanor Gateneby. The opportunity to scan the original print allowed me to extract data which simply was not there in the earlier copy, this proved to be most informative, the picture above is a close up of the window behind the pump. 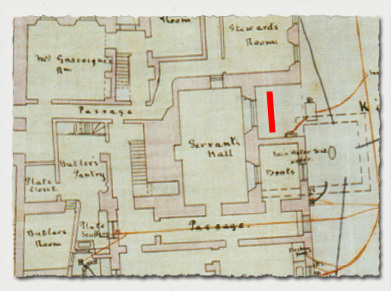 The room beyond the window was the Servants Hall as shown on the plan, the pump location is identified by the red strip. Looking at the window two things are apparent, firstly the glass has been smashed in some of the panes and secondly and most significant, there is vegetation growing in what should be the Servants Hall! So that part of Parlington has gone, the weeds are testimony to the open space beyond the stone window. The Servants Hall is no more, so perhaps the oldest part of Parlington has been obliterated. The stonework surrounding the pump looks very old, could this be part of the hall that dates back to the sixteenth century, the fact that it is in the inner most part of the building suggests it is from the earliest period.